A survival expert is capable of staying alive when the odds are stacked against them. They can find an advantage in even the aridest and desolate of areas. To stay alive and keep their energy levels up, food and water are essential. 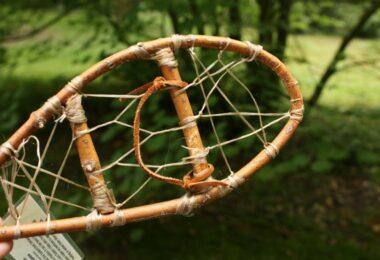 When thrown into a survival situation, even the pickiest eaters must be creative with what’s on the menu. There is food all around, unfortunately, many people just don’t recognize certain things as food. But what if you’re lost in the harshest of conditions, such as a desert? The scorpion is another survival expert, one that has adapted to life in the dry, desolate deserts around the world. Packed full of protein, abundant in certain areas and fairly easy to find and catch, they may just save your life. Eating scorpions may not sound appealing to the squeamish, but they are actually very tasty when prepared correctly. Naturally, being a venomous creature catching and eating scorpions can be dangerous. Read on for tips and tricks on how to safely catch, prepare and enjoy the ultimate desert survival food. Before all of that, the question on your lips demands an answer. From a young age, many people are taught to stay away from creatures that can sting or bite. This is sage advice and should generally be followed. Scorpions, with their famous stingers are regarded as the kind of creature one should avoid. 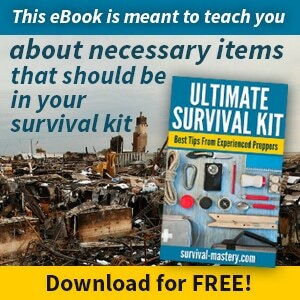 In a survival situation, however, you may not have that luxury. Fortunately, scorpions can indeed be eaten. It is recommended that they are cooked first but they can be eaten raw. It is essential that the stinger and venom glands are removed if they’re to be eaten raw however. The stinger can be left on if the scorpion is well cooked, as the venom breaks down when heated. In China for example, it is normal for the stinger to be left on. Legend tells that there are certain medical benefits of doing so. Aside from Chinese medicine, there are many benefits to eating scorpions in a survival situation. 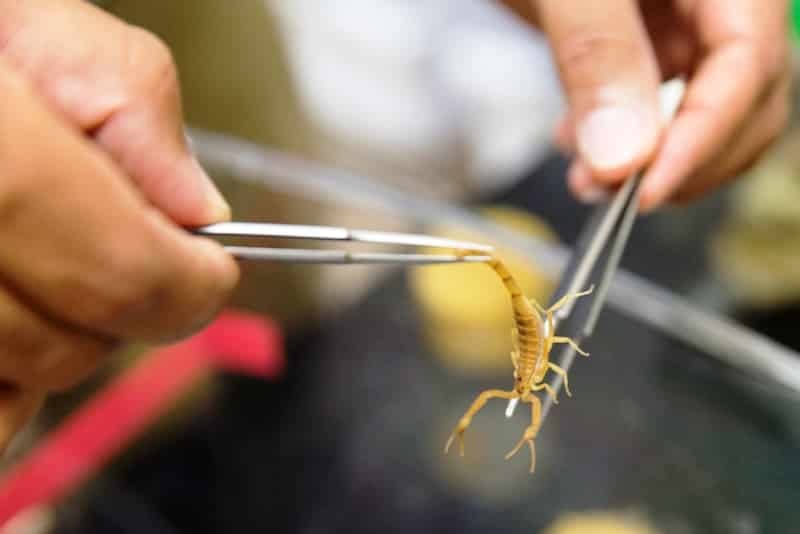 Protein – Scorpions – and other bugs – are packed full of protein. While beef typically has a 20% protein content, scorpions can pack as much as 80%. Calories – This may seem like an issue for weight watchers, but in a survival, situation calories count. It’s important to stay energized and scorpions, with their high-calorie count, certainly help. Population – In certain areas, scorpion populations are very high, creating a fairly reliable food source. Capture – With a few tips and tricks up your sleeve, it’s not difficult to catch a large number of scorpions without getting stung. Taste – The taste, when cooked, has been likened to the crispy chicken skin, popcorn, shrimp and even crab. When raw it doesn’t taste like much at all. Rest assured, it can be perfectly safe to eat scorpions. In fact, the health benefits may even encourage you to eat them outside of survival. However, there is a bit more to eating scorpions than simply knowing that you can. It’s easy to be stung if you don’t know what you’re doing. It’s a good idea to know the type of scorpion you’re likely to encounter and where. There are over 1,500 different species of scorpions. Of those, only around 40 are deadly to humans. The power of the sting or venom differs, with some feeling similar to a bee sting, while others are closer to a bullet ant bite and can lead to illness or death. An allergic reaction from an otherwise non-deadly sting can result in death, so don’t take any chances. Scorpions generally prefer warm, dry climates. Semi-arid regions are often teeming with scorpions. However, this is an adaptable creature and scorpions can be found in forests, jungles, savannahs, caves and even mountains. These nocturnal creatures generally spend most of the day hidden away under rocks, logs and other nooks and crannies. Some species burrow into the earth. During the night they actively hunt and roam around. These natural predators will typically ambush their prey. They feast on a variety of insects, spiders and smaller scorpions, occasionally using their venom to paralyze them. They use their venom to break down their food, before sucking up the remains. As such, it is unlikely a scorpion is host to tapeworms or other parasites. 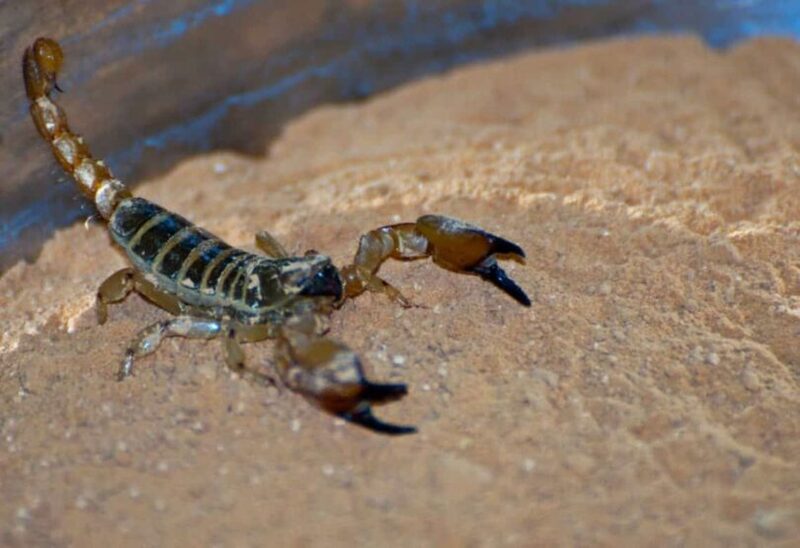 Bark scorpion – This is the most venomous scorpion in the States. The sting is extremely painful and can lead to numbness and vomiting for up to 72 hours. Certain areas of the body can become immobilized if stung, such as the hand or foot. Though rare, the sting can be deadly to humans. In particular the elderly, children and those with poor immune systems. They are light brown in color, and grow up to 4” in length, with a slender tail and legs. They enjoy semi arid conditions and can be found under rocks, logs or behind tree bark during the day. They’re also frequently found near citrus trees and orchards. Rotten pine wood is another favorite hiding place. Giant hairy desert scorpion – This is the largest scorpion in the US. Its sting is thankfully not very potent, often being likened to a bee sting. Some people are allergic to it however, which can be fatal in extreme cases. They’re typically found in the Sonora and Mojave deserts, in low altitude valleys. They burrow, but can also often be found under rocks during the day. They’re yellow, with a darker back and can grow as big as 7” long. Stripe-tailed scorpion – The telltale stripes and thick tail distinguish this from a Bark scorpion. It’s similar in color, yellowish brown, but with dark stripes running vertically along its back and tail. Its venom is not particularly dangerous to humans, though some pain may be experienced. It enjoys a humid climate and dwells under rocks on sandy soil. They typically grow to around 2½” in length. With an idea of what you’re up against, it’s easier to know how to go about catching scorpions. With a few tips and tricks, you’ll have no problem finding them, not only in the desert but in many other areas they inhabit. For those who would want it easy, see our tips on how to scout for edible snails for survival. One thing that the vast majority of scorpions have in common is that they glow under UV light. The reason for this is largely unknown, though there are several theories. For anyone looking for scorpions to eat, this is a fantastic advantage. 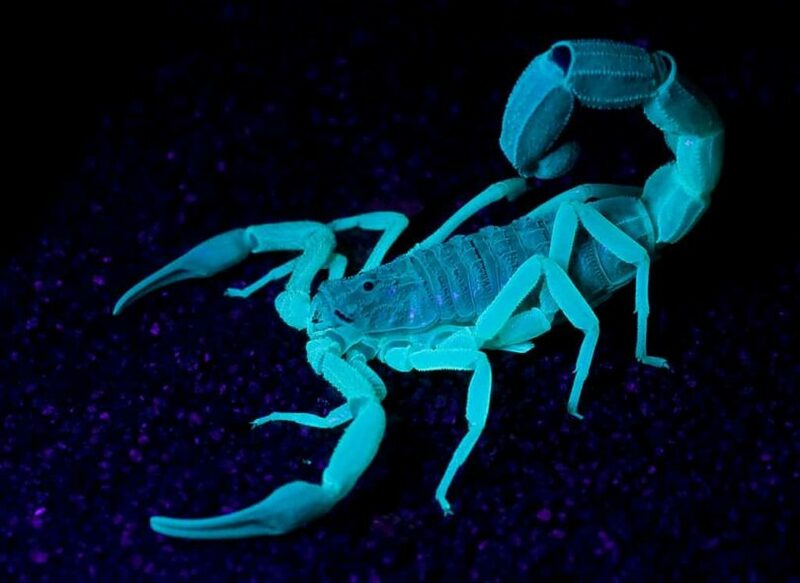 With a UV light, head out when it’s dark and the scorpions are most active. They will stand out no matter how good their natural camouflage is. This is also a great method to use in caves. For anyone hunting any type of burrowing scorpion, traps can be set. You need only know the signs that give their hiding places away. While it is light, get close to the ground and look for small holes beneath low hanging rocks, tree roots, crevices or logs. 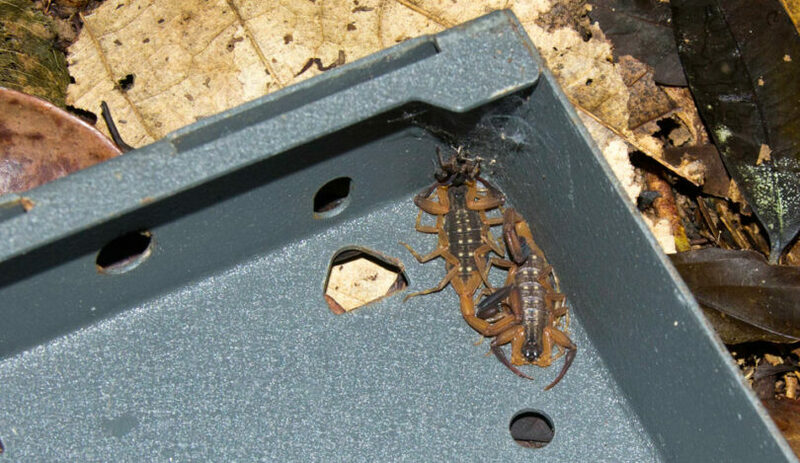 This is typically a scorpion’s den. In front of the den, dig another hole, big enough to fit a cup, or other wide mouthed container in. At night, the scorpion will leave its burrow and fall into your trap. The smooth, vertical sides will ensure that it cannot escape. In the morning, kill it in the container and it’s yours to eat. In the desert, rocks often shelter sleeping scorpions during the day. Simply turn over as many rocks as you can. You’re bound to find a few scorpions sheltering beneath. Outside of the desert, scorpions favor several other hiding holes. Logs, in particular rotten pine, are another favorite. Turn these and prepare to catch a scorpion or two. Peel bark from trees to expose other hiding scorpions. In certain Asian countries, it is common practice to locate scorpion burrows and simply dig into them. Once the scorpions are located, catch them and put them away for later. In the right area, this can be a very lucrative method. Now that you’ve caught some scorpions, you need to know what to do with them. They are fast and dangerous, so just grabbing them with your bare hands could be a fatal mistake. 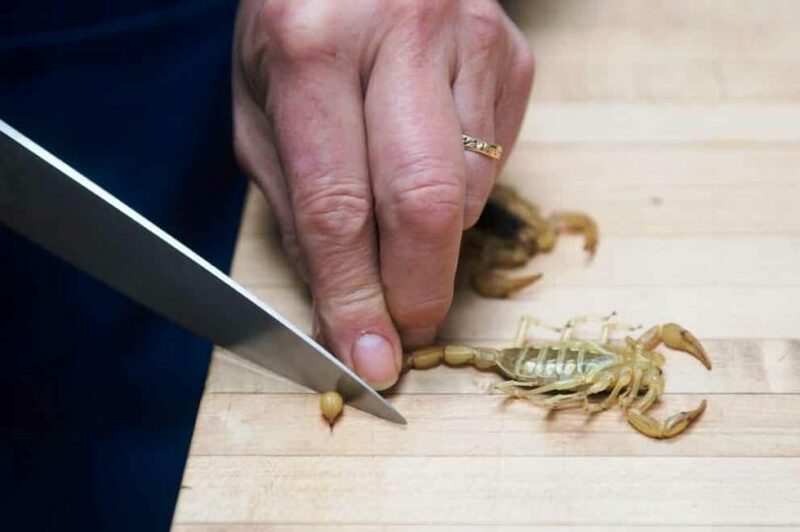 Like most foods scorpions need a little bit of preparation before being eaten. Scorpions aren’t the fastest creatures in the world, but they can move quick enough to sting the would-be hunter. The sting can really pack a punch and should be avoided at all costs. If possible, wear gloves when handling scorpions. If that isn’t possible, use a long pair of tongs. 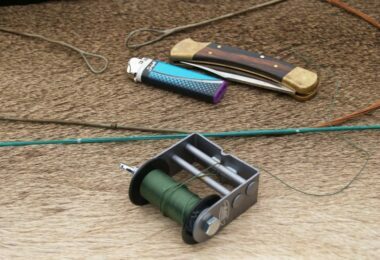 Of course, in a survival situation, these items are luxuries you’re unlikely to have access to. Ideally, you want to keep the stinger away from you at all times. If possible use a thin, sturdy stick to hold the scorpion down by the tail. The quickest way to kill a scorpion is to pierce the hard outer shell and crush its head. A sharp object is the best tool to do this with, though a blunt object can also be used. If possible, pin the tail and stinger down with a stick before going in for the kill. Once the scorpion is dead it’s almost time to eat it. Though it is dead, it’s still dangerous until the stinger and venom gland have been removed. The stinger is located at the tip of the tail, and the venom gland is directly below it. In some scorpions, this is a bulbous section at the end of the tail, but with other species, it is not so obvious. You may notice some of the slightly opaque venom leaking out after you’ve cut the stinger and gland off. Once that is done, the rest of the scorpion can be consumed. 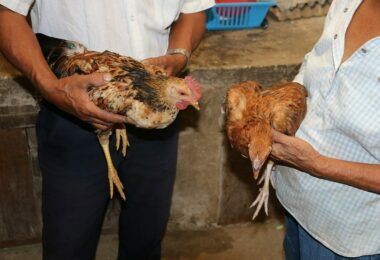 It’s better to cook them, partly to improve the taste, but also to ensure they are clean. It’s unlikely that a scorpion will carry parasites, but not impossible. If there is no alternative, however, they can be eaten raw. 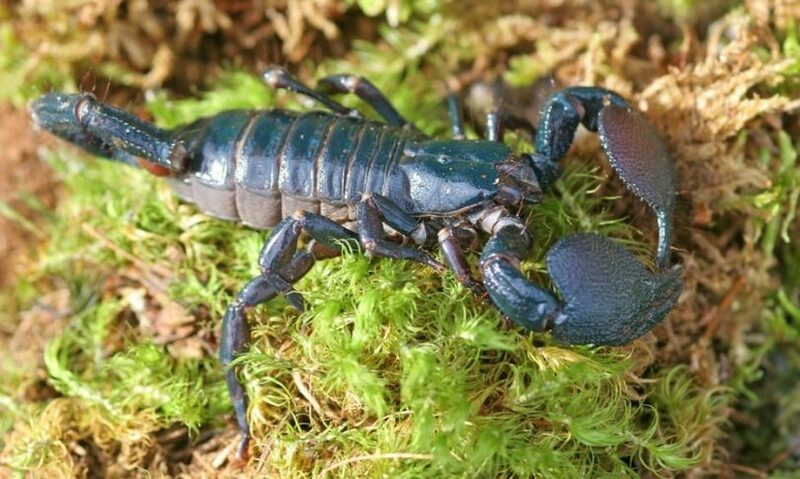 The entire scorpion is edible once the stinger and venom gland have been removed. Just pop it in your mouth and chew. It is not uncommon to leave the stinger and venom gland on if you’re planning to cook the scorpion. The venom becomes denatured and adds more protein. 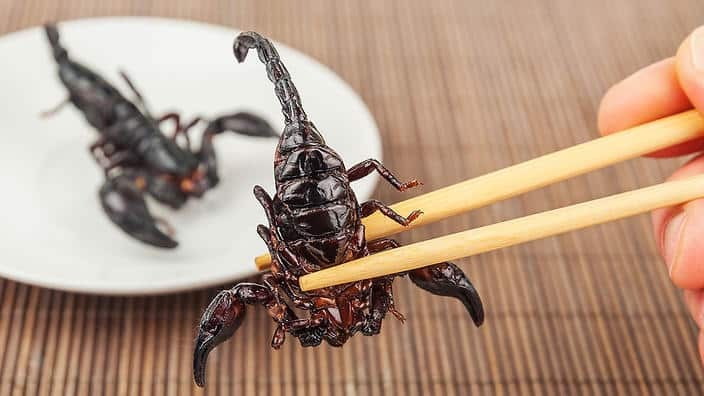 In China, it is believed that eating a scorpion with the stinger on will make you strong! The risk is that you may be allergic to some of the properties of the venom. In a survival situation, an allergic reaction is something you’ll want to avoid at all costs. It’s best to err on the side of caution. 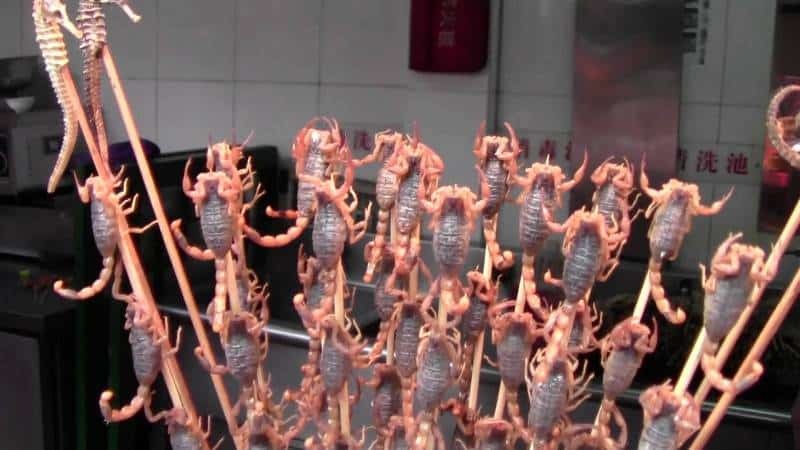 The easiest way to cook a scorpion is to skewer it and roast it over a fire or hot coals. Imagine you’re toasting marshmallows, it’s the same process. Don’t hold it too close to the heat or it’ll burn. Hold it back a bit and turn it from time to time to ensure it’s cooked all over. Once it becomes a nice brown color it’s ready to eat. Gobble the whole thing down and don’t worry about the shell, all of it is now edible. Like lobster or crab, the best meat is in the tail and claws. It should be somewhat crispy and crunchy. Outside of a survival situation, there is no reason why scorpions cannot become part of your normal diet. They taste great, they’re abundant and there are many recipes using scorpions as an ingredient. You can even buy frozen scorpions in certain shops nowadays. If you’re catching your own, the best way to store them is to freeze them. Freezing them alive is the most humane way to kill scorpions, as they will simply drift off into an endless sleep. Don’t thaw them out too soon, though, as they have been known to survive being frozen alive. The stinger and venom gland should be removed as before unless you’re confident that it will not harm you. Once you have plenty in the freezer you can use them in many ways. Scorpion soup is a popular dish, and scorpion scaloppini is quick, easy and delicious. More often than not, scorpions are simply flash fried. Use searing hot oil, and a couple of minutes or so in the pan – depending on the size – is all they need. Once cooked, season with salt and pepper, or a spice mix of your choice and tuck in. 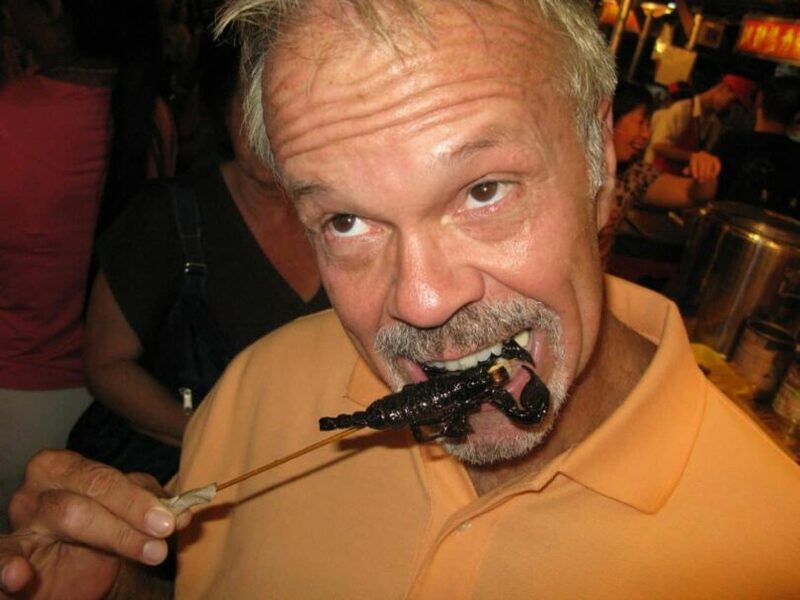 To sum up, yes, you can eat scorpions and yes, they are tasty. But they should be handled with care. Never forget that these creatures can be deadly. This is especially true in areas you’re not familiar with. Use caution when collecting them, no matter how desperate the situation is. A sting from a scorpion can turn a bad situation into a life-threatening situation in minutes. Remember, if you are unable to cook them, it is essential that you remove the stinger and venom gland. It’s good practice to do this even if you are cooking them, just to be on the safe side. But why wait until you’re caught in a desperate situation? Consider taking a trip into the desert on your own terms and start hunting scorpions. This way you’ll have a good idea about what to look for and how best to handle them. When your life depends on eating scorpions, it will be that much easier since you already know what you’re doing. 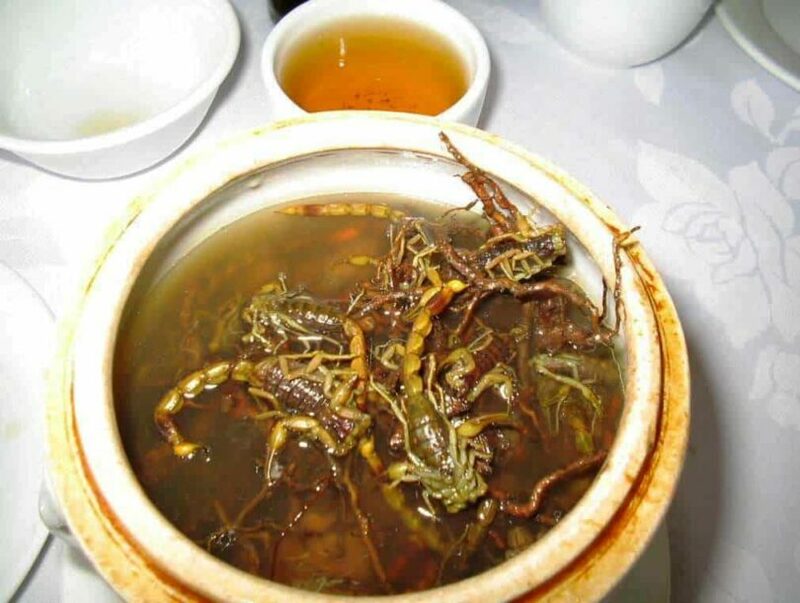 Have you ever eaten scorpions? Tell us how they were in the comments section! 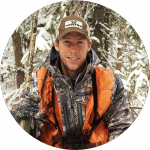 Check out our informative article on ways to survive the wilderness to enlighten you on this important topic.